My friend Pamela resents the label “Senior Citizen Education” as used by St. Thomas University for their innovative outreach program. And I agree, I much prefer the “lifelong learning” designation used by the University of Minnesota for its equally innovative Osher Lifelong Learning Institute. One implies a certain age, while one implies a certain perspective. But in the end, I don’t mind being classified as a “senior” if it opens the door to the jazz education opportunities that I have experienced over the past few years. Besides, I carry my AARP card and collect a school district pension, so who’s fooling who? Now I’m back at St. Thomas for fall semester and what seems to be the most interesting class yet. Using Marian McPartland’s Piano Jazz (the long-running National Public Radio program) as a model, Joan brings in a guest musician each week and we’re treated as participant-observers as Joan interacts with her guest through words and music. Her first guest happened to be one of my local favorites, pianist Laura Caviani. Joan and Laura recently completed a recording project of Brazilian music (Sambanova) but have played together off and on for years. Predictably, Laura started off with a Monk tune—I don’t think I have ever heard Laura perform without slipping in a bit of Monk, or sometimes a lot of Monk. But this was the first time I heard Monk played as a piano/bass duet—Joan brought along her electric bass because “I didn’t’ want to drag the upright from Minneapolis.” Without drums, we’re able to focus more clearly on the climbing intervals of “Misterioso” and enjoy how one blues oriented pianist interprets another. They finish the tune and the conversation begins, Laura describing the 12-bar blues form, the foundation of intervals of 6ths, the use of the whole tone scale, Monk’s atypical chords that make his compositions so readily identifiable, even to novice ears. Somehow they turn to a jazz history lesson, how Laura’s introduction was stride-based, how the role of the bass in bop freed up the pianist’s left hand. 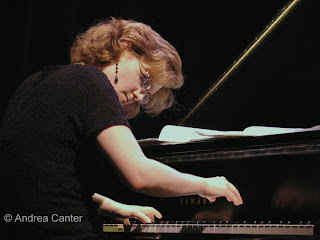 We get snippets of Laura’s background, the daughter of a classical cellist (mom) and avid jazz fan (dad), how despite her classical training she often found herself composing jazz compositions even before she really played jazz, how she transcribed a McCoy Tyner recording before learning that jazz musicians don’t play the exact same music twice. Questions flew from my fellow students—the difference between composing and improvising; how Laura developed her “blues” sensibility (largely inspired while living in Kansas City), whether she first composes a melody or the chords? They talk about the importance of the audience to performers—“The audience is central,” says Joan, “we feel your energy up here.” We get a quick lesson in jazz forms, the use of chords to create tension and release. Laura demonstrates how one goes from the straight melody to embellishments to new melodies by changing chords. We hear Laura’s beautiful composition, “Paper Cranes,” inspired by a World War II memorial sculpture when studying in Japan; Joan and Laura perform one of the pieces from Sambanova. With their instruments or dialogue, Joan and Laura converse like old friends, which they are, and we’re drawn into the conversation. Something even Marian McPartland can’t do on Piano Jazz—the audience is invisible, passive listeners. We “seniors” on Wednesday mornings at St. Thomas are not only part of the audience, we become part of the music. An evening of beautiful music awaits on Sunday, September 21st at 7 pm at the Artists Quarter when Joan and Laura officially launch Sambanova. 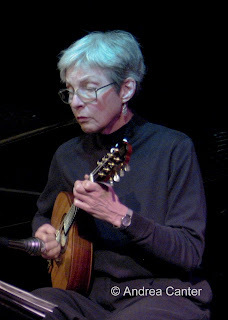 Photos: (top) Joan plays mandolin at the Artists Quarter, as she will on September 21st. (Bottom) Laura Caviani. Photos by Andrea Canter.